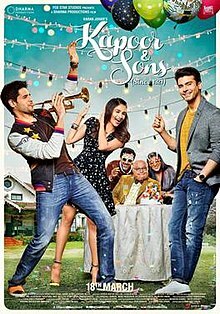 Kapoor & Sons, also known as Kapoor & Sons (Since 1921), is an Indian Hindi-language drama film directed by Shakun Batra and produced by Karan Johar, Hiroo Yash Johar, and Apoorva Mehta under the banners of Dharma Productions and Fox Star Studios. The film stars an ensemble cast featuring Rishi Kapoor, Ratna Pathak Shah, Rajat Kapoor, Fawad Khan, Sidharth Malhotra, and Alia Bhatt. Kapoor & Sons tells the story of two estranged brothers who return to their dysfunctional family after their grandfather suffers a cardiac arrest. The film was released worldwide on 18 March 2016 and received positive reviews mainly for its direction and performances, especially of Rishi Kapoor, Ratna Pathak Shah and Fawad Khan. Made on a budget of ₹35 crore (US$5.2 million), the film earned over ₹152 crore (US$23 million) worldwide. At the 62nd Filmfare Awards, Kapoor & Sons won five awards, including Best Supporting Actor for Rishi Kapoor, Best Story, and Best Screenplay. It also was nominated for Best Film. Estranged brothers Rahul (Fawad Khan) and Arjun Kapoor (Sidharth Malhotra) are compelled to return to their childhood home in Coonoor when their 90-year-old grandfather Amarjeet (Rishi Kapoor) suffers a heart attack. Rahul is a successful writer who appears to be the most mature in the family. Meanwhile, Arjun struggles to get his books published, resorting to working part-time as a bartender to make ends meet, while writing in his spare time. Their parents, Harsh (Rajat Kapoor) and Sunita Kapoor (Ratna Pathak Shah) favour Rahul for being successful, which upsets Arjun. While the brothers struggle to get along, their parents grapple with their troubled marriage. Harsh is discouraging of Sunita's wish to open a catering business and Harsh's past extra-marital affair is a sore spot in their relationship. Amarjeet reveals that his last wish is to take a family photo titled "Kapoor & Sons, since 1921". At a party, Arjun meets Tia Malik (Alia Bhatt), and the two hit it off. Rahul and Tia also meet, and the two go out for dinner. However, Rahul is shocked when she spontaneously kisses him. Tia reveals to Arjun that she lost her parents at the age of thirteen and lives alone. Arjun too reveals that Rahul's bestselling novel's idea was similar to his but he never confronted his brother so as to not break the family apart. Tia tells her friend that she loves Arjun but regrets involving herself with Rahul. The Kapoor family throws a party to celebrate Amarjeet's birthday. Arjun discovers that Tia and Rahul know each other and fears that Rahul and Tia have something between them, but Rahul clarifies that he is already in a committed relationship in London. Problems arise when the family finds out that Harsh invited Anu, the woman he had an affair with. A family argument ensues, ending the party. Harsh and Sunita later reminisce on how happy they were. Harsh apologises for losing all their money. The Kapoor family tries to fulfill Amarjeet's wish to take a family photo but are unsuccessful when secrets are revealed. Rahul finds out that his father was lying about having ended the affair, while Sunita discovers that the relationship Rahul has in London is actually with another man. Tia tells Arjun what happened between her and Rahul, calling it a mistake. Arjun finds out Rahul has been reading his script, and confronts him about stealing his first story. A shaken Sunita then reveals to Arjun that she was the one who gave Rahul his story, thinking Arjun had no interest in writing. Amidst all this, Harsh dies in a car accident. Rahul comes out as gay to Arjun and the two leave for London and New Jersey, respectively. After four months, the duo receive a video message from Amarjeet, in which he requests them to come back, as he is feeling alone. Sunita comes to terms with Rahul's homosexuality, the misunderstanding between Arjun and Tia is cleared and they get back together. The family finally takes the family photo Amarjeet wanted, where they place a cutout of Harsh in his memory. The music for the film is composed by Amaal Mallik, Badshah, Arko Pravo Mukherjee, Tanishk Bagchi, Benny Dayal and Nucleya. The background score is given by Sameer Uddin. The lyrics are penned by Badshah, Kumaar, Manoj Muntashir, Dr. Devendra Kafir, and Abhiruchi Chand. Sony Music India have acquired the music rights of the film. Sameer Uddin won the Filmfare Award for Best Background Score at the 62nd Filmfare Awards. The film's first song "Kar Gayi Chull", a party song, was released on 17 February 2016. The second song "Bolna" was released on 24 February 2016. The full music album was released on 4 March 2016 by Sony Music India which consists of 5 songs. Times of India's Mohar Basu film critic didn't like the idea of multiple composer. In his 3 out of 5 stars review, he mentioned "Kar Gayi Chull" as the only well composed song of the album. Swetha Ramakrishna, journalist of Firstpost mentioned that the adapted songs of the film hadn't brought a new thing to the table except for the slight change of lyrics. She, however praised Arko's "Sathi Re" and felt that other songs of the album are forgettable. Rohwit of The Quint, giving the album one and a half star, said the album has nothing new to offer. He noted that "Bolna"'s tune was reminiscent of Pakistani songs like "Samjhawan" and "Laiyya Laiyya". The former being recreated in Humpty Sharma Ki Dulhania. Asees Kaur was acclaimed for "Bolna" by critics like Rediff.com's Aelina Kapoor. Some critics such as Surabhi Redkar of Koimoi noted that "Budhu Sa Mann" had resembles to Mallik's previous hit song "Sooraj Dooba", but Mallik couldn't deliver up to a mark with this one. "Bolna" was seen by critics to have been included because of Fawad Khan's presence. The film upon its release received critical praise, especially for Fawad Khan's role. Srijana Mitra Das from The Times of India gave it 4.0 stars & said, Kapoor & Sons's star is its story. An entirely real family full of uncomfortable secrets, awkward jealousies, & sharp pain where brothers steal, parents cheat, siblings suspect, & 'perfect bacchaas' don't have perfect love-lives. Rohit Vats of Hindustan Times gave it 4/5 stars and called it a "fantastic family drama after a long time". Harshada Rege of DNA gave the film 4/5 stars and praised all characters in general and Fawad Khan in specific saying, "it's Fawad who shines bright. His performance at the "perfect" son with a secret, stands out. The actor shows versatility and vulnerability with equal ease. There's a lot more to this actor than good looks and charm". Anupama Chopra of Film Companion gave it 3.5/5 stars and commended the onscreen performances saying, "The actors breathe life in these movements." Saibal Chaterjee of NDTV gave the film 3.5/5 stars and said, "Kapoor And Sons is intense and incisive in its observation of human inadequacies but is always entertaining". Raja Sen of Rediff.com gave it 3/5 stars and said, "A likeable enough little film with fine characters, Kapoor & Sons tries too hard to turn on the water works at the end, going from a good, mellow drama to a full-blown melodrama by the end of it all". Ankush Bahuguna of MensXP.com gave the film 4/5 stars and called it "breathe of fresh air" and "one of the best family films ever made in Bollywood". Subha Shety-Saha gave it 4/5 stars and praised star cast saying, "it is the near perfect casting that works for the film too". Rachit Gupta of Filmfare praised the film saying, "it will be a tough order for any film this year to be as good as Kapoor & Sons". Dhriti Sharma of Zee News said, "The movie looks like a beautiful tiara, an amalgamation of fine comic punches that further grow with twists and curls into electrifying chemistry, ultimately rising to the reality block-- distorted yet perfect family". Bollywood Hungama gave the film 4 stars and wrote that the film "makes for an excellent movie that you must watch with your entire family. This film is Beautiful kar gayi chul!". Stutee Gosh of The Quint gave the film 4.5/5 saying, "The first half is rib-tickling and super fun while the real action in the form of plot twists awaits us in the second half". She, although having praised Khan's performance, said his looks distracts viewers from parts of the film. Mehul S Thakkar of Deccan Chronicle gave it 4.5/5 and said, praising direction of the film, "all credit goes to director Shakun, who holds together the cast like a perfect photo in an album. His sensibilities in this family drama will certainly set a new benchmark". Shubhra Gupta of The Indian Express, gave 2 stars out of 5 stating, Sidharth brings to the table a loose-limbed pleasing vulnerability which he reveals slowly. Fawad plays his straight but awesome role. Namrata Joshi from The Hindu called it "the ultimate family film" and commented, "It is yet another film that has been brilliantly crafted and mapped out in terms of the writing, how the scenes slowly get built up towards a crescendo. It’s an onion peel narrative in which the relationships, revelations, secrets and lies, unfinished confidences, unresolved issues, betrayals and conflicts are unspooled layer by layer." Talking about the characters, she described Khan's role "charming and delightful", Malhotras' as "solid and vulnerable", Bhatt as "hyper and ditzy" while calling Kapoor's role as "disappinting and out of sync". Ananya Bhattacharya of India Today gave the film 3.5 stars and summarised the film as "madhouse drama" while stating, "Shakun Batra's Kapoor And Sons wins in being able to portray the quick fixes that every family has to employ sometime or the other. This is what shines through. Batra crafts a refreshing tale of family problems and the art of sweeping them under the carpet. She also praised Khan's role, while praising the Rajat Kapoor and Pathak's characters as "incomparable". She also applauded the film's cinematography and music. Anna M.M. Vetticad of Firstpost summed up the film as "the best film of 2016 so far". She stated, "Kapoor & Sons is hilarious, heartwarming and heartbreaking rolled in one. It does not wear its social conscience on its sleeve, but make no mistake about this: it has one. This is a disarmingly entertaining, thoughtful film that evokes a fuzzy feeling of warmth. It left me with wet cheeks, a smile on my face and a chuckle welling up in my throat at the memory of Daadu". Nirmalya Dutta of Daily News and Analysis described Khan's role as a gay male as "a big leap forward for India's LGBT movement," noting that in India, where it is illegal to be gay, "Khan had the guts and gumption to play this seminal role." Surabhi Redkar form Koimoi gave the film 3.5 stars and mentioned, "Kapoor And Sons is a modern-age family drama. It does not shy away from being emotionally soppy yet convincingly lovable. You could laugh, cry and smile through this one!". Redkar praised the characters' realistic nature. Manjusha Radhakrishan of Gulf News gave it 3.5 stars and said, "Kapoor & Sons flourishes as a unit and is the sum total of mature performances by the entire Kapoor clan". Rachel Slatz of New York Times said, "Even though “Kapoor & Sons” goes from lightly comic to more darkly dramatic to pretty overtly melodramatic, it never loses its lived-in quality or plunges into the absurd". Deepa Gaurl of Khaleej Times gave it 2.5/5 and said, "Kapoor & Sons is heart-warming alright but fails short of building on the fantastically captured 'reality' it achieves early on, ending up 'neither here nor there." Although her review of the film was moderate, she praised Fawad Khan's performance saying, "The film, to a great extent, belongs to Fawad Khan – and he is terrific". Suprateek Chaterjee of HuffPost wrote, "Oddly enough, despite several chaotically edited sequences that have little breathing space and rely largely on exposition, the film feels bloated". ARY News praised Shakun Batra's direction writing, "Batra creates a very watchable portrait of a house in crisis". It also commended Rajat Kapoor, Ratna Pathak Shah, and Khan for their performances. Zeshan Ahmad of The Express Tribune gave the film 4/5 stars and wrote, "Kapoor & Sons is a lesson in how a film can be entertaining, emotional and thought-provoking at the same time. A compelling script and brilliant performances in particular make it a must-watch!". Sana Fatima of The Nation gave it 8/10 stars and called it "one of the most methodically planned family drama". Daily Times wrote, "Nonetheless, the story manages to descend bare into the psyche of audiences with debonair imagery tied with picturesque beauty, keeping you mesmerized". Arva Aslam of Daily Pakistan said that all the credit for the film goes to its cast. On opening day the film had its 900 prints released on 1500 screens and collected ₹6.85 crores in India to become fourth biggest opener of the year. On second day, the film collected ₹7.75 crores and took its two days collection to ₹14.60 crore. The film, on its first Sunday, collected ₹11.75 crores taking its domestic weekend's net collection to ₹26.35 crores. This was the second highest opening weekend collection of the year. Within its weekdays, the film became the 4th highest grossing Bollywood film of the year surpassing the lifetime collections of Mastizaade and Jai Gangaajal. In the first week, the film collected ₹47 crore which is the second highest opening week collection of the year following Airlift. The film continued running on more than 1000 screens in the following week. In the second week, the film collected ₹17.14 crore raising its domestic collection to ₹65.07 crore. After three weeks of theatrical run, the film collected ₹71.57 crore and grossed ₹102.24 crore. It became the third film of year to gross more than ₹100 crore. The film collected ₹19.27 in its opening weekend overseas and became the highest first weekend opener of the year. In Pakistan, the film released on 67 screens and collected ₹13 million on the first day. In the first weekend it collected ₹36 million from Pakistan and became Fawad Khan's highest weekend opener in Pakistan, surpassing his previous romantic-comedy Khoobsurat. Kapoor & Sons also had the biggest opening week of the year in the international market as it collected ₹4.2 million. By the end of its theatrical run, the film had collected ₹17.91 crore (US$2.5 million) from North America, ₹11.66 crore (US$1.6 million) from UAE, ₹6.39 crore (US$890,000) from Pakistan, ₹5.28 crore (US$730,000) from UK, ₹1.73 crore (US$240,000) from Australia, ₹63 lakh (US$88,000) from New Zealand, ₹14 lakh (US$19,000) from Malaysia, and ₹19 lakh (US$26,000) from Germany. The lifetime overseas collection of the film was ₹47.75 crore (US$6.6 million) and it eventually became the fourth highest grossing Bollywood film overseas in 2016 following Sultan, Ae Dil Hai Mushkil, and Fan. ^ "KAPOOR AND SONS (12A)". British Board of Film Classification. 11 March 2016. Retrieved 16 March 2016. ^ Malvania, Urvi (19 March 2016). "Kapoor and Sons off to a decent start at box office". Business Standard. Retrieved 28 March 2016. ^ a b "Box Office: Worldwide Collections of Kapoor & Sons". Bollywood Hungama. Retrieved 28 March 2016. ^ Bollywood Hungama. "Kapoor & Sons". bollywoodhungama.com. ^ Bollywood Hungama. "Alia Bhatt – Sidharth Malhotra to play siblings long with Fawad Khan in Kapoor & Sons". Bollywood Hungama. Retrieved 22 August 2015. ^ "'KAPOOR and SONS' shoot begins". The Times of India. 10 May 2015. Retrieved 22 August 2015. ^ "Kapoor & Sons trailer: It has all the ingredients of a blockbuster". Hindustan Times. Retrieved 10 February 2016. ^ "62nd Filmfare Awards 2017: Winners' list". The Times of India. 15 January 2017. Retrieved 15 January 2017. ^ "We Bet You Did Not Miss Elena Fernandes in 'Kapoor & Sons', Here's More About The Hottie". 21 June 2016. ^ "Alia Bhatt to Romance Sidharth, Fawad Khan in Kapoor and Sons". NDTV. Retrieved 22 August 2015. ^ "Here is the cast of upcoming Dharma Productions 'Kapoor & Sons'!". DNA India. 25 March 2015. Retrieved 22 August 2015. ^ "Fawad's role in Kapoor And Sons was rejected by 6 actors, confirm KJo – The Express Tribune". 8 April 2016. Retrieved 27 December 2016. ^ "Kapoor & Son: Alia Bhatt & Siddharth Malhotra's dance moves in kar gyi chull will get you grooving". m.ibnlive.com. 17 February 2016. ^ "'Bolna' from 'Kapoor And Sons': This might just be the love song of the season!". DNA India. 24 February 2016. Retrieved 26 February 2016. ^ "Kapoor & Sons (Since 1921) [Original Motion Picture Soundtrack] – EP by Various Artists on iTunes". iTunes Store. 4 March 2016. Retrieved 4 March 2016. ^ "Music Review: 'Kapoor & Sons'". Times of India. 17 January 2016. Retrieved 22 June 2018. ^ Swetha, Ramakrishan (5 March 2016). "'Kapoor and Sons' music review: Nothing exciting in this album apart from 'Kar Gayi Chull'". Firstpost. Retrieved 22 June 2018. ^ "Music Review: 'Kapoor & Sons' Is a Predictable Letdown". The Quint. 9 March 2016. Retrieved 22 June 2018. ^ Aelina, Kapoor (12 March 2016). "Review: Kapoor & Sons music rocks". Reddiff.com. Retrieved 22 June 2018. ^ Redkar, Surabhi (15 March 2016). "Kapoor And Sons Music Review". Koimoi. Retrieved 22 June 2018. ^ Srujee, Sudhakaran (14 March 2016). "Kapoor & Sons music review: Alia Bhatt, Sidharth Malhotra and Fawad Khan's romantic drama SCORES more with its party numbers!". Bollywoodlife. Retrieved 22 June 2018. ^ "Reviews are in: Is 'Kapoor & Sons' worth the hype?". The Express Tribune. 22 March 2016. Retrieved 21 June 2018. ^ Afshan, Zahra (19 March 2016). "Fawad Khan immensely praised for 'Kapoor and Sons'". Aaj News. Retrieved 21 June 2018. ^ The Times of India (18 March 2016). "Kapoor & Sons review". m.timesofindia.com. Retrieved 18 March 2016. ^ Rohit, Vats (19 March 2016). "Kapoor & Sons review: This is family drama at its best". Hindustan Times. Retrieved 21 June 2018. ^ Harshada, Rege (19 March 2016). "Kapoor And Sons Review: Fawad Khan steals the show in this tale of loving your dysfunctional family!". Daily News and Analysis. Retrieved 21 June 2018. ^ Anupama, Chopra (19 March 2016). "Kapoor & Sons Movie Review". Film Companion. Retrieved 21 June 2018. ^ Saibal, Chaterjee (19 March 2016). "Kapoor And Sons Movie Review". NDTV. Retrieved 21 June 2018. ^ Raja, Sen (18 March 2016). "Review: Kapoor And Sons is sweet but too sappy". Rediff.com. Retrieved 21 June 2018. ^ Ankush, Bahuguna (19 March 2016). "'Kapoor & Sons' Movie Review: If You've Ever Felt Like Running Away From Your Family, This One's For You". MensXP.com. Retrieved 21 June 2018. ^ Subha, Shety Saha (18 March 2016). "'Kapoor and Sons' – Movie Review & Rating". Mid Day. Retrieved 21 June 2018. ^ Rachit, Gupta (18 March 2016). "Filmfare's Review of Kapoor & Sons". Filmfare. Retrieved 21 June 2018. ^ Dhriti, Sharma (19 March 2016). "Kapoor and Sons movie review: Do not miss Alia-Sidharth-Fawad's spring surprise!". Zee News. Retrieved 21 June 2018. ^ "Kapoor & Sons Review". Bollywood Hungama. Retrieved 18 March 2016. ^ Stutee, Gosh (19 March 2016). "Movie Review: Kapoor & Sons Is Rib-Tickling and Un-Bollywood-Like". The Quint. Retrieved 21 June 2018. ^ Mehul S, Thakkar (18 March 2016). "Kapoor & Sons movie review: Family drama genre finds new benchmark". Deccan Chronicle. Retrieved 21 June 2018. ^ Joshi, Namrata. "Kapoor & Sons: The ultimate family film". The Hindu. Retrieved 18 March 2016. ^ Bhattacharya, Ananya. "Kapoor and Sons movie review: Fawad, Alia, Sidharth in a madhouse drama". India Today. Retrieved 18 March 2016. ^ Vetticad, Anna M.M. "Kapoor & Sons review: Move over 'Neerja', this Alia, Fawad, Sidharth-starrer is the best film of 2016". Firstpost. Retrieved 18 March 2016. ^ "Kapoor and Sons: Why Fawad Khan's role is a big leap forward for India's LGBT movement – Latest News & Updates at Daily News & Analysis". 26 March 2016. Retrieved 27 December 2016. ^ Redkar, Surabhi. "Kapoor And Sons Review". Koimoi. Retrieved 18 March 2016. ^ Manjusha, Radhakrishan (17 March 2016). "Kapoor & Sons review: a touching, terrific film". Gulf News. Retrieved 21 June 2018. ^ Rachel, Slatz (19 March 2016). "Review: 'Kapoor & Sons' Centers on an Indian Family's Flaws". New York Times. Retrieved 21 June 2018. ^ Deepa, Gaurl (19 March 2016). "Kapoor & Sons: From real to clichéd". Khaleej Times. Retrieved 21 June 2018. ^ Suprateek, Chaterjee (19 March 2016). "'Kapoor & Sons' Review: We Are Family, I Got All My Issues With Me". HuffPost. Retrieved 21 June 2018. ^ "Movie Review: Kapoor and Sons". ARY News. 19 March 2016. Retrieved 21 June 2018. ^ Zeshan, Ahmad (22 March 2016). "Review: 'Kapoor & Sons' begs to be heard, not just watched". The Express Tribune. Retrieved 21 June 2018. ^ Sana, Fatima (19 March 2016). "Movie Review: Kapoor & Sons". The Nation. Retrieved 21 June 2018. ^ "Kapoor And Son movie review". Daily Times. 19 March 2016. Retrieved 21 June 2018. ^ Arva, Aslam (19 March 2016). "Kapoor & Sons: Review". Daily Pakistan. Retrieved 21 June 2018. ^ "'Kapoor and Sons' 1st day box office collection: Sidharth-Alia-Fawad-starrer turns 4th biggest opener of 2016, beats 'Jai Gangaajal'". International Business Times. 19 March 2016. Retrieved 22 June 2018. ^ "Kapoor & Sons box office collections: Alia Bhatt, Sidharth Malhotra starrer earns Rs 14.60 crore by Day 2". Financial Express. Retrieved 22 June 2018. ^ Jogindar, Tuteja (21 March 2016). "Kapoor & Sons Now 2nd Highest Weekend Grosser Of 2016". Koimoi. Retrieved 22 June 2018. ^ "Kapoor And Sons Becomes The 4th Highest Grossing Film Of 2016". Koimoi. 24 March 2016. Retrieved 22 June 2018. ^ "Kapoor & Sons First Week Box Office Collections". indicine. 25 March 2016. Retrieved 22 June 2018. ^ "Kapoor and Sons box office collections: Alia, Sidharth starrer earns Rs. 65.07 cr". The Indian Express. 1 April 2016. Retrieved 22 June 2018. ^ Ankita, Mehta (8 April 2016). "'Kapoor and Sons' grosses Rs. 100 crore in India, set to beat 'Neerja' lifetime earnings record". International Business Times. Retrieved 22 June 2018. ^ "'Kapoor & Sons' box office collection: Karan Johar's film garners over Rs 25 crore over the weekend". DNA. Retrieved 22 June 2018. ^ "'Kapoor & Sons' impress on opening weekend". The Express Tribune. 21 March 2016. Retrieved 22 June 2018. ^ "Kapoor & Sons Box Office Report: Fawad Khan, Sidharth Malhotra and Alia Bhatt starrer nets Rs 100 crore!". India.com. 26 March 2016. Retrieved 22 June 2018. ^ "TOP GROSSERS OVERSEAS 2016". Retrieved 30 December 2016. ^ "Happy with IFF Melbourne honour for 'Kapoor & Sons': Shakun Batra". The Indian Express. 18 August 2016. Retrieved 22 June 2018. ^ "Indian Film Festival Melbourne". 19 August 2016. Retrieved 30 December 2017. ^ "Fawad Khan wins award at film festival in Melbourne". Daily Times. 16 August 2016. Archived from the original on 1 October 2017. Retrieved 1 October 2017. ^ "Fawad Khan wins award at film festival in Melbourne". ARY News. 13 August 2016. Archived from the original on 1 October 2017. Retrieved 1 October 2017. ^ "Fawad Khan wins award at the Indian Film Festival of Melbourne". DAWN. 13 August 2016. Archived from the original on 1 October 2017. Retrieved 1 October 2017. ^ "Star Screen Awards 2016 winners: Amitabh Bachchan-starrer Pink bags four awards, Alia Bhatt receives best actress". 5 December 2016. Retrieved 27 December 2016. ^ Iyengar, Aarti. "Stardust Awards 2016 FULL winners list: Shah Rukh Khan, Priyanka Chopra, Aishwarya Rai Bachchan win BIG". Retrieved 27 December 2016. ^ Hungama, Bollywood (19 December 2016). "Nominations for Stardust Awards 2016 – Bollywood Hungama". Bollywood Hungama. Retrieved 27 December 2017. ^ "62nd Filmfare Awards 2017: Complete winners' list". Times of India. 29 January 2017. Retrieved 22 June 2018. ^ "Fawad Khan, three Pak singers nominated for Filmfare awards". Hindustan Times. 18 March 2017. Retrieved 22 June 2018. ^ "62nd Filmfare Awards: Here is the full nominations' list". India Today. 10 January 2017. Retrieved 22 June 2018. ^ "Winners of the 62nd Filmfare Awards 2017". Filmfare. 11 January 2017. Retrieved 22 June 2018. ^ "Filmfare Awards 2017 Nominations | 62nd Filmfare Awards 2017". Filmfare. Retrieved 27 December 2017. ^ "MMA Mirchi Music Awards". MMAMirchiMusicAwards. Retrieved 24 March 2018. ^ "Big ZEE Entertainment Awards: Nominations list". BizAsia | Media, Entertainment, Showbiz, Events and Music. 22 July 2017. Retrieved 27 December 2017. ^ "Zee Cine Awards 2017 complete winners list: Alia Bhatt, Amitabh Bachchan bag top honours". The Indian Express. 12 March 2017. Retrieved 27 December 2017. ^ Aarti, lyengar (2 April 2017). "Zee Cine Awards 2017 FULL winners list: Salman Khan, Alia Bhatt, Pink, Sultan win BIG". bollwoodlife.com. Retrieved 22 June 2017. ^ "IIFA Awards 2017 winners list: Shahid Kapoor, Alia Bhatt named Best Actor, Actress; Neerja is Best Film". Firstpost. Retrieved 27 December 2017. ^ "18th IIFA Awards 2017: List Of Nominations". NDTV.com. Retrieved 27 December 2017. This page was last edited on 21 April 2019, at 07:59 (UTC).